By buying this product you'll earn up to 46 Rewards points. Running short of HDMI inputs on your TV, but need to hook up a few more entertainment sources such as a cable box, Blu-ray player, or video game system? 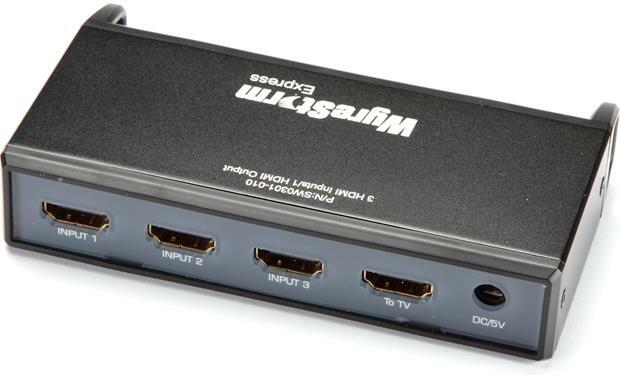 The WyreStorm SW-0301 switcher allows you connect three different components into one HDMI port. It supports video formats up to 1080p and is 3D-capable. Choose your connected source via the front-panel controls or the supplied remote. You can also integrate the SW-0301 with your existing universal remote. Perfect HDMI connection. It automatically turns itself on, and connects to the source. Will this work in concert with a Harmony Companion/Hub? HDMI Switcher (3 inputs/1 output): The WyreStorm Express EXP-SW-0301 (v2) is an HDMI switcher that enables 3 HDMI audio/video sources to be simultaneously distributed to a single HDMI display output with control via front-panel buttons or IR remote. It offers support for up to 4K video and 7.1ch multichannel audio. HDMI 2.0: The WyreStorm EXP-SW-0301 (v2)'s HDMI inputs/output are version 2.0 (HDCP 2.2 compliant) and support ultra HD, HD, and SD video formats up to 4K. The EXP-SW-0301 (v2) is also 3D capable and supports multichannel audio up to 7.1ch, like Dolby TrueHD and DTS-HD Master Audio. It automatically negotiates EDID signals from source to display for seamless communication between devices. Video Format Supported: Supports ultra HD 4K video resolutions (4096x2160 @60Hz/4:2:0/8-bit), 4K (3840x2160p @30Hz/4:4:4/12-bit). Also supports high definition video resolutions (1080p/1080i/720p) and standard definition video resolutions (480p/480I). Audio Format Supported: Supports DTS-HD Master Audio, Dolby True HD, DTS, Dolby Digital. and 2ch PCM. 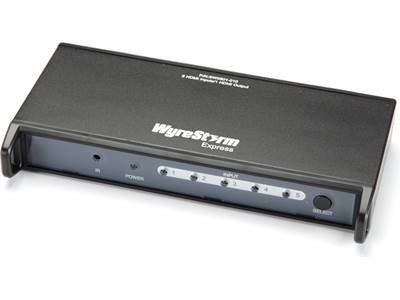 Note: The WyreStorm EXP-SW-0301 (v2) supports 4K video transmission up to 23' and 1080p video transmission up to 49'. 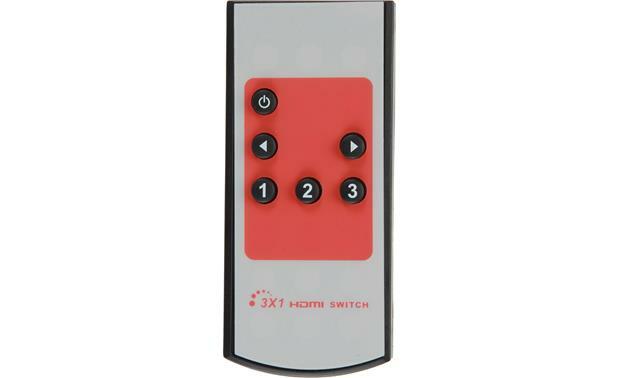 Input Select Control: The WyreStorm Express EXP-SW-0301 (v2) features Input Select buttons (1-3) across its front-panel and on its IR remote control. Also includes an IR receiver, if the HDMI switcher is hidden. 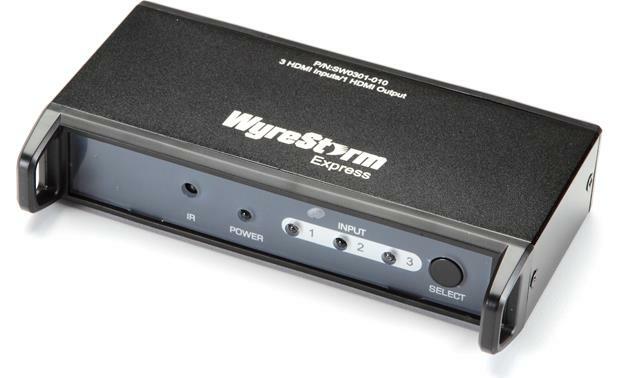 Power Requirements: The WyreStorm Express EXP-SW-0301 (v2) draws it power directly from your HDMI cable of your source devices (no external power supply required). However, it is compatible with an external 5V DC power supply. I used this hdmi switch as a temporary solution until I upgraded my TV. I would NOT use this unless necessary especially with newer tech. Will this work well with an Amazon Fire TV Cube as well as a PS4? Also, does this unit support 4K televisions. Thanks. It's just a switcher. If your devices have HDMI outputs, it should work with them. Searches related to the WyreStorm Express SW-0301 HDMI switcher (3-in/1-out).